Derren Brown storms London Town. 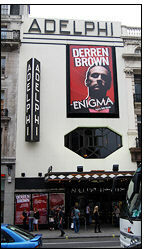 Derren Brown wasn't the only one reading minds on Wednesday night at the opening of Enigma at the Adelphi Theatre in London's West End. The whole audience knew exactly what each and everyone else was thinking, which was "how the hell did he just do that?!" The genius of Derren's work is simple - he's put the magic back into magic - and audiences love it. He's happy to blow their minds, and they are happy to have them blown! As the lights went down the audience buckled-up in anticipation - ready for a ride that had more twists in it than any corkscrewing roller coaster I've ever been on. 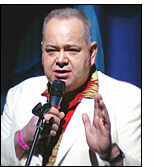 And whereas magicians in recent years have become almost afraid of 'fooling' their audiences, Derren revels in it. He knows that some love trying to fathom out what on earth is going on, how it's all done and if it's "for real". Audiences like to think and to be stretched, by a performer who really knows how to engage with them. They want to be part of the show, and they want to have fun. 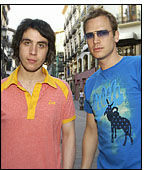 Derren delivers in spades. He's mastered his art, without becoming a clever-clogs in the process (the downfall of many). Sweden's Got Talent - magician wins! 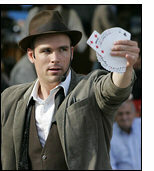 Charlie Caper, magician and street performer won Sweden's Got Talent (Talang 2009) a week last Friday. Charlie spent many hours putting together three hard-hitting two minute acts, taken from the magic show he has performed for years on the street. Charlie tells us that he was both extremely happy and a little surprised to think that a magic act could be placed first in a competition like Sweden's Got Talent, in the end winning thanks to phone votes from viewers. The final was seen by a sixth of the county's population! Charlie Caper performed in London's Covent Garden for a few years in 2002-2004 and then started touring the festival/street show circuit. He's toured the world three times, and performed in 29 different countries. Charlie now plans to spend time in Sweden and try to create a mainstream career for himself there. This summer he has shows booked in Europe and Canada and will also be competing for Sweden at FISM in China.